I had a wonderful day today. Amanda and I have been talking about heading to a Nordstrom Rack together since last summer. Neither of us had been able to do anything more than a short drop in before. So today was the day. We also went a nearby mall that had dozens more stores than we are used to! 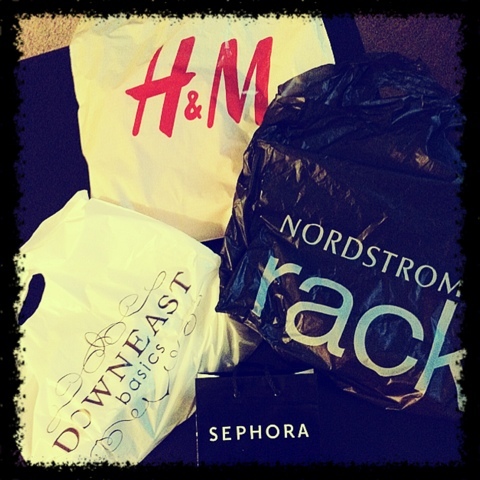 I went into stores like Lush, H&M, Sephora, and so many more that I had only heard about! They blew my mind! But sometimes it is easy to become unsatisfied. I see all the better dressed people out there...all the clothes I can't (or choose not to) afford...and slowly, discontent can begin to set in. At a moment like this, I feel as though my heart has gotten dirty. It is not the joyful, thankful heart that headed out this morning. I need to be refreshed. I need to go back to my Savior, to be washed in Him. I need to meditate on Him. To take joy in my Savior and to return to a place of contented thankfulness. I need to be washed and satisfied. Not satisfied in what I have. Not a satisfaction conjured up by reminding myself how lucky I am compared to poor people in Africa. I need to simply sit at the feet of my Savior and let Him satisfy me! How? I need to find peace in the knowledge of who He is and what He has done for me (the gospel)! So that is what I am going to do. Worship music, prayer, and maybe listen to a sermon on my iPhone. =) I hope you can find time today to be refreshed in Jesus today! What do you do when you needed refreshing and cleansing? Do you ever get "stained" by jealously and discontent?